For personal reasons, I haven't been a fan of Halloween in the recent years. Despite that, I still can't escape the immense creativity that goes on during the season. Every year, I'm continuously surprised and inspired by all the ideas and pairings of costumes: ie. Koala bear and tree (a pairing, too cute), Miley Cyrus and Robin Thicke (despise their little "performance" but the costumes were funny), etc. This year I was browsing nail art photos, and since the popularity of 3D nails and nail designs has grown int he past few years, there were so many awe-inspiring nail designs for Halloween 2013. 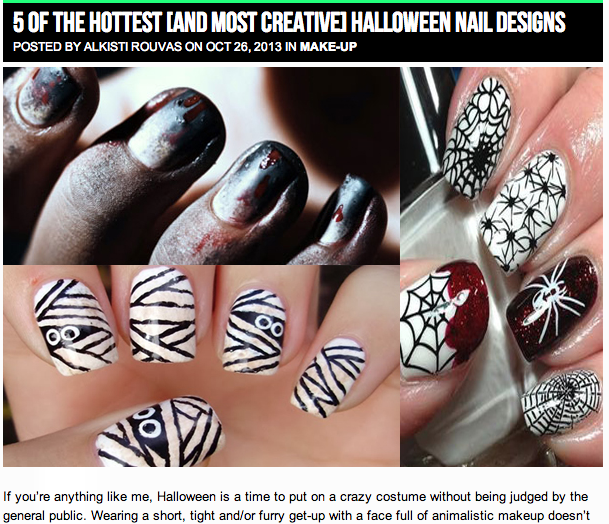 Therefore, for Indecent Exposure, I compiled 5 Halloween nail designs that truly inspired me this halloween, and even warmed me up to the idea of the costume and ghoul filled holiday. Click here to access the article and site! What are you favourite halloween nails this year? Have you come up with any designs? haha Agreed :) Thanks for stopping by!